Friday March 24th is National Cheese Steak Day. What better way to celebrate than with Free Cheesesteaks! Friday, March 24, 2017, 12pm-6pm. Tony Luke’s celebrates the Grand Reopening of its Sicklerville, NJ store on National Cheesesteak Day, March 24th, 2017. 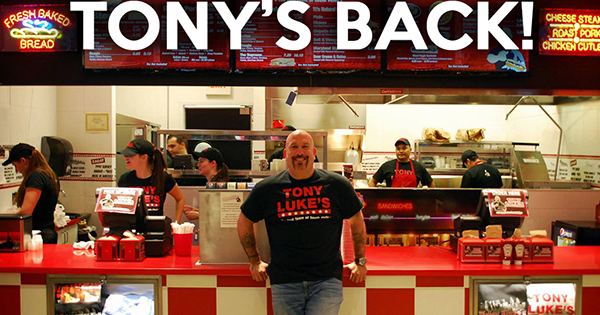 Tony Luke, Jr. will own and operate this Tony Luke’s Store and will give out FREE cheesesteaks to all from 12pm – 6pm while supplies last. Tony Luke’s will also donate a portion of proceeds of all cheesesteak sales from all our locations that day to the HollyRod Foundation in support of Autism Awareness! The HollyRod Foundation is dedicated to providing compassionate care to those living with autism and Parkinson’s disease.